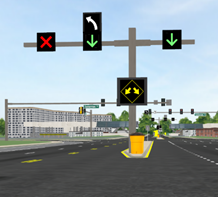 The objective of this project is to conduct a series of human factors experiments to evaluate the most effective signing and marking strategies for real-world implementations of dynamic reversible left turn lanes (DRLT) for diamond interchanges and contraflow left turn pockets (CLTP) for signalized intersections. A DRLT treatment is designed for implementation at diamond interchanges experiencing heavy LT volume. DRLT treatment can reduce delay and increase capacity without requiring additional right-of-way.1 This is accomplished by converting the center lane (two back-to-back LT bays in figure 1a) into a full-length LT lane accessible by both directions of traffic (figure 1b). The use of the LT lane by each direction of traffic is allocated through signals. 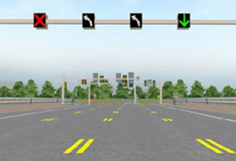 A CLTP treatment is designed for implementation at conventional signalized intersections with heavy LT volume. It makes use of the opposing through lane (OTL) when it is not in use by opposing traffic (i.e., when the cross street has priority) to provide an additional temporary LT bay, without requiring the construction of an additional lane. The CLTP lane operation begins when the leading protected LT phase ends on the cross street. After the area shaded in green in figure 2 clears of LT traffic from the cross street, a pre-signal on the up-stream end of the CLTP lane notifies drivers that they may queue in the CLTP lane. Both LT lanes discharge during the protected LT phase at the main signal. 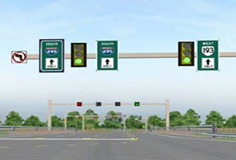 Before the end of LT phase, the pre-signal closes the CLTP lane; after a calculated discharge phase designed to clear the CLTP lane, the protected LT phase on the main approach ends to give priority to through traffic. Peak period contraflow operations have been deployed at multiple locations around the United States to mitigate congestion issues associated with temporary spikes in demand from commuter traffic. The DRLT and CLTP operations are also recommended for use during peak periods; however, the direction of flow on these short roadway segments innovatively change direction within the signal cycle. 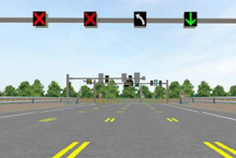 This research project is tasked with the development of signing and marking strategies that can effectively communicate the operation of the treatments to novice users in a highway driving simulator (HDS). The suggested signing and marking strategies for real-world implementation of the DRLT and CLTP went through two critical iterations: the first based on comments recorded during the expert panel meeting and the second based on the results of the sign lab study. 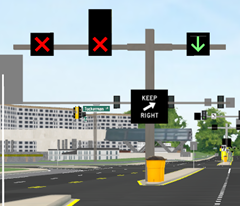 During the expert panel meeting, members of Federal Highway Association Research and Development, the FHWA Manual on Uniform Traffic Control Devices (MUTCD) team, Maryland State Highway Administration, and Virginia Department of Transportation developed acceptable scenarios for signing and marking the treatments. The sign lab study included 65 participants brought onsite to the Turner-Fairbank Highway Research Center (TFHRC) to evaluate the aforementioned innovative signing and marking strategies from an application, comprehension, and preference perspective. Ultimately, one signing and marking scenario for each treatment was selected for coding and implementation in the HDS at the TFHRC. 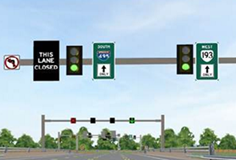 Close cooperation with the MUTCD team throughout the entire process has ensured that the signing and marking scenarios recommended for analysis in the HDS meet guidelines established in the MUTCD and are readily implementable by interested agencies. The HDS study is ongoing and results are expected to be reported by the Office of Safety Research and Development in an upcoming publication for 2018. 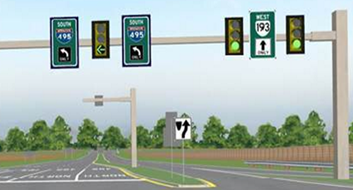 Still images captured from the ongoing HDS study signing and marking configurations can be viewed in figures 3, 4, and 5 for the DRLT and figure 6 for the CLTP lane. Figure 3(a). On-peak upstream signalized intersection recommendations (DRLT). Figure 3(b). 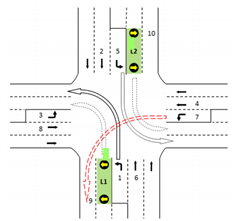 Off-peak upstream signalized intersection recommendations (DLRT). Figure 4(a). On-peak mid-bridge gantry recommendations (DLRT). Figure 4(b). Off-peak mid-bridge gantry recommendations (DRLT). Figure 5. On-peak downstream gantry recommendations (DRLT); during off-peak, leftmost changeable message sign will display a white-on-black “THIS LANE CLOSED” message. Figure 6(a). On-peak pre-signal recommendations (CLTP). Figure 6(b). Off-peak pre-signal recommendations (CLTP).